1 of 5 Heat oven to 400 F. Generously coat 12 cups in a muffin pan with nonstick cooking spray. 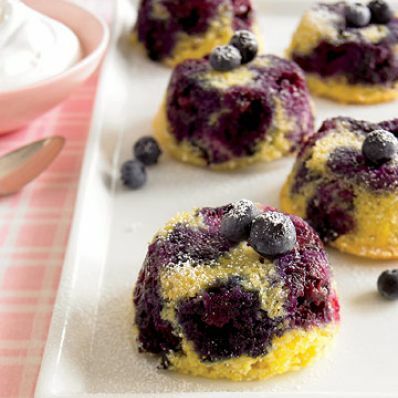 Place 5 or 6 blueberries in each muffin cup; set aside. 2 of 5 In a medium-size bowl, stir corn bread mix, egg, granulated sugar and milk until combined. 3 of 5 Top the blueberries with 1 tablespoon of batter. Repeat with another layer of 5 or 6 blueberries and 1 tablespoon of batter on top. Muffin cups should be about half full. 4 of 5 Bake at 400 F for 10 minutes. Cool in muffin pan on rack for 5 minutes. Run a sharp knife around each cup and remove cakes to racks to cool completely. 5 of 5 To serve, turn upside down. Dust with confectioners' sugar and top with a dollop of whipped topping, if desired.